Come literally in the clouds, in this beautiful and unique holiday home. This amazing group home is decorated around the theme ballooning, inspired by the book by Jules Verne's "Five Weeks ballooning over Africa. This theme has been elaborated to the smallest detail. The accommodation is also very high quality finished and has many facilities. 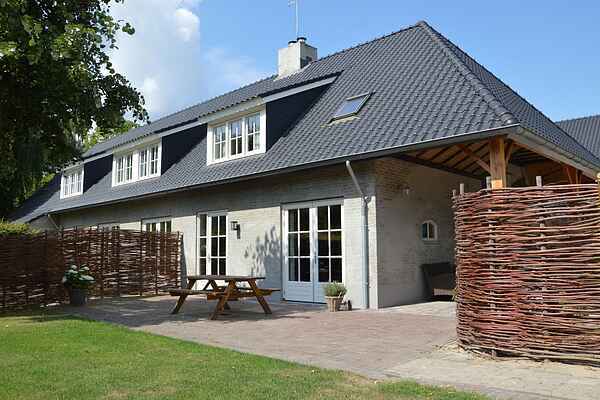 This resides is the combination of two cottages that can also be rented separately. Therefore the house has two luxury spacious living rooms with both a multimedia TV and wood stove and kitchen. The various bedrooms have their own TV and almost all the rooms have a private bathroom. In some rooms you can sleep in a real balloon basket as if you are flying over a National Park. Furthermore there is a wonderful secluded garden with patio at your disposal. De natural surroundings lends itself for walk or bike rides. For example in the National Park Loon Drunse Dunes. There is enough space for Children to enjoy themselves, in the immediate vicinity you will find a football pitch and children's playground. In addition, Safari Beekse Bergen and amusement Park the Efteling are nearby.